In the Czech Republic, the Christmas season is a big deal. The country has a storied history filled with annual traditions that may seem a bit unusual to tourists. As locals typically spend Christmas Eve and Christmas Day at home with the family, an explanation of the seasonal customs provides an insider look for visitors. For guests of the country visiting during December, there are many local events and activities to explore. Christmas Eve in the Czech Republic is celebrated with a grand feast. The featured dish is fried carp, which was purchased earlier and may be kept alive in the bathtub until ready for cooking. The Christmas tree gets decorated on Christmas Eve. Traditionally, the tree gets decorated with apples and sweets, as well as traditional ornaments, but modern households sometimes use commercially purchased Christmas ornaments. Santa Claus is not the gift giver in the Czech Republic. Instead, Baby Jesus (Ježíšek) brings children presents on Christmas Eve. Usually, the children leave the room where the Christmas tree has placed until they hear the tinkle of a bell (rung by parents) indicating that Baby Jesus has delivered the gifts. The Baby Jesus is said to reside high in the mountains, in the town of Boží Dar, where a post office accepts and stamps letters addressed to him. St. Mikulas, or St. Nicholas, also brings gifts, but at the beginning of December, on St. Mikulas Day. St. Mikulas is dressed like a bishop in white clothing, rather than in the red Santa suit. Christmas Eve may culminate with midnight mass, or the family may go to mass on Christmas Day, then enjoy the noon meal together. A common holiday superstition in the Czech Republic is that food and household can foretell the future of the coming year. To know if good or bad luck awaits, cut an apple in half and review the inside core. If the core shows four corners, that means that bad luck is on the way, while a five corner core translates to good fortune ahead. For young women that are hoping for love, tossing a shoe over a shoulder at the nearest door is the tradition—if the shoe points at the door, then marriage is in the cards. Visitors who aren't lucky enough to wrangle an invite from a local family can enjoy still enjoy the season with an assortment of public festivities. In Prague, the Christmas tree in Old Town draws thousands each year. 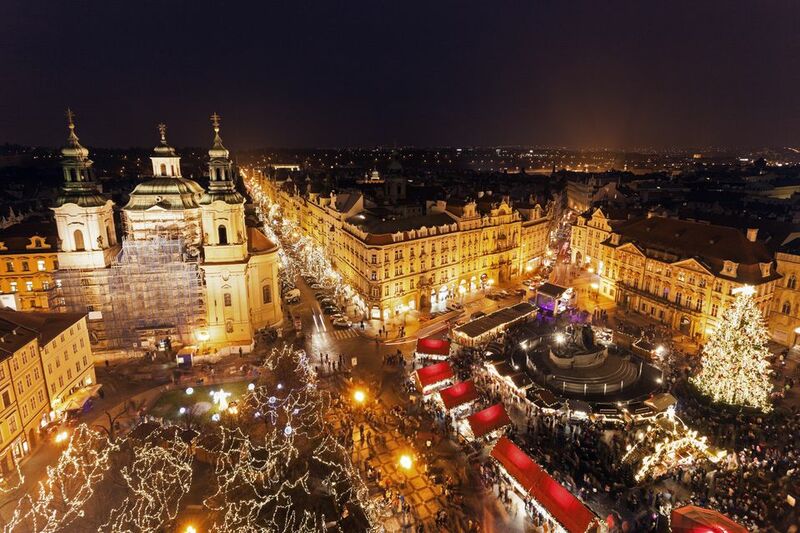 The public square is the site of the city's most famous Prague Christmas Market with dozens of stall selling local treats, gift options, and decorations. Visitors to Prague can enjoy live nativity scenes, ice skating, and other Czech Christmas traditions throughout December. A few hours from Prague awaits the castle, Český Krumlov. The best-known residents are a quartet of furry friends that are the centerpiece of the castle's Christmas with the Bears event. In town, there are carolers, an Advent photo studio, and even a wintertime cruise down the river. The South Bohemian city of České Budějovice is known for its musical entertainment. Buglers, pipers and folklore groups entertain the crowds in Přemysl Otakar II Square and provide a melodic background to the annual Christmas market.